Xiaomi Redmi Note 6 Pro comes with 6.26-inch (2280×1080 pixels) Full HD+ 19:9 Notch Display which produces good colors and Viewing Angle. The Display is brighter than Redmi Note 5 Pro. The Display is protected by Gorilla Glass No details which on which version. Redmi Note 6 Pro comes Snapdragon 636 processor with Adreno 509 GPU which we have seen in Redmi Note 5 Pro. Performance is decent. It comes with 4 and 6GB RAM and 64GB internal storage. you cant Play PUBG at higher settings. Gaming works fine, There is a heating issue while playing games for a long time overall performance is decent in day to day life there was no Lag. Xiaomi should have gone with Snapdragon 660 to take On Realme 2 Pro and Honor 8X. If you like Playing Games lot than Note 6 Pro is not for You. Xiaomi Redmi Note 6 Pro has a 12MP rear camera with dual-tone LED Flash, f/1.9 aperture, 1.4μm pixel size, Dual Pixel Autofocus, EIS, secondary 5MP camera and 20MP front-facing camera f/2.0 aperture, secondary 2MP camera. Both front & Rear Camera can record 1080P Videos. It also comes with Adjustable bokeh, Light Trail and Studio Lighting which works with portrait mode. Studio Lighting only works when Image is of human Face for other objects it does not work all three modes work for Rear Camera only. The front camera also has support for portrait mode. It has also support for AI Mode. Camera performance is good from both front & Rear Cameras, Portrait Mode works well. Video recording is Stable and Looks good low light Video recording is average. Xiaomi Redmi Note 6 Pro comes with 4000mAh battery which is able to deliver one and Half day of Battery Life on Heavy use with Normal use It can easily last for 2 days. In our test, we got Around 9 Hours of Screen Time. With Gaming on Mobile Data and Wifi Battery lasted for 6 Hours. Xiaomi Redmi Note 6 Pro camera can record videos up to a 1080P processor is capable of shooting 4K videos. Xiaomi Redmi Note 6 Pro support Qualcomm quick charge 3.0 Xiaomi Ship 2A Charger in the Box. To Buy Fast charger you have to Spend more Rs 500. Charging Time with Fast charger is 10 Min Less compared to Box 5V 2A Charger. 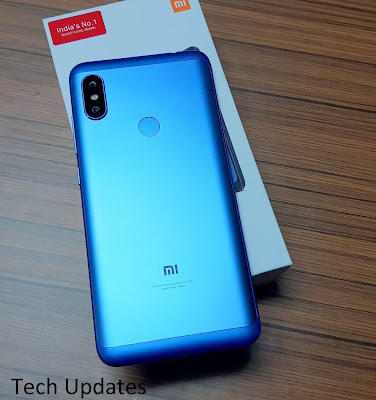 Xiaomi Redmi Note 6 Pro comes in Black, Blue, Red and Rose Gold color priced at Rs 13999 for 4GB RAM and Rs 15999 for 6GB RAM.